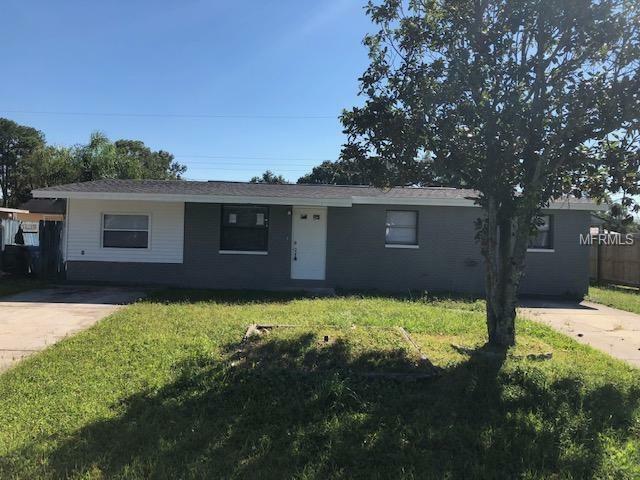 Come see this Professionally REMODELED 4 bedroom 2 bathroom BLOCK home in the heart of Tampa. ALL WORK WAS DONE WITH COUNTY PERMITS AND TO CODE. List of updates include: Laundry room connection, Smoke detectors, Electrical updates, Plumbing updates, A/C system, Roof. From the moment you drive up youll immediately be impressed with the double sided driveway, brand new paint and ROOF. Inside you have NEW Shaker Kitchen cabinets with ISLAND, Quartz countertops, and NEW under mount kitchen SINK, FAUCET, Disposal & NEW STAINLESS STEEL appliances. From the kitchen access your large covered porch thru the BRAND new sliding glass door. Neutral PORCELAIN tiles and baseboards THROUGHOUT. All bedrooms have NEW CARPET. The electrical has been updated with ALL NEW recessed can lighting in kitchen, SWITCHES, SOCKETS, GFCIs and a ceiling fan in the living room. Both BATHROOMS have been COMPLETELY GUTTED and now offer brand NEW TOILETS, VANITIES, PLUMBING, FAUCETS, MIRRORS and DESIGNER TILE with Decorative ACCENT border and NEW TUB. The interior was painted with neutral paint and the exterior is a modern gray with light trim. ENJOY the BACKYARD from your screened and covered PORCH. ABSOLUTELY NOTHING TO DO IN THIS MOVE-IN READY BEAUTY. Don't miss this great home close schools, Raymond James, local highways and shopping.